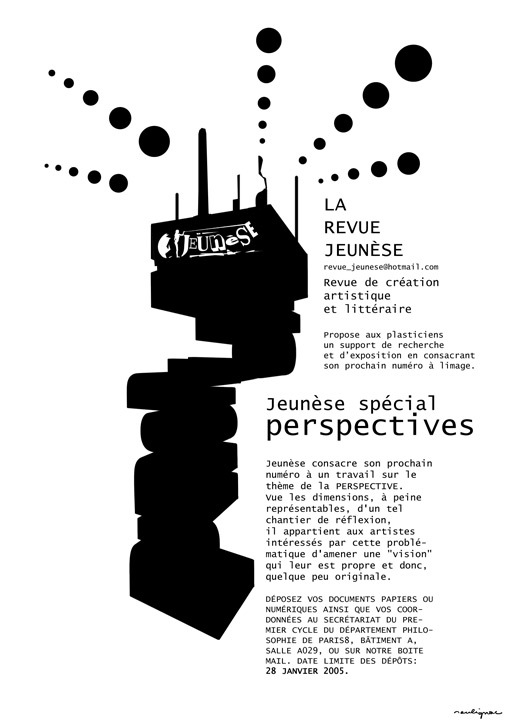 Revue Jeunèse was a fanzine designed by students and Professors from Philosophy and Fine Art Department of Paris 8 University. 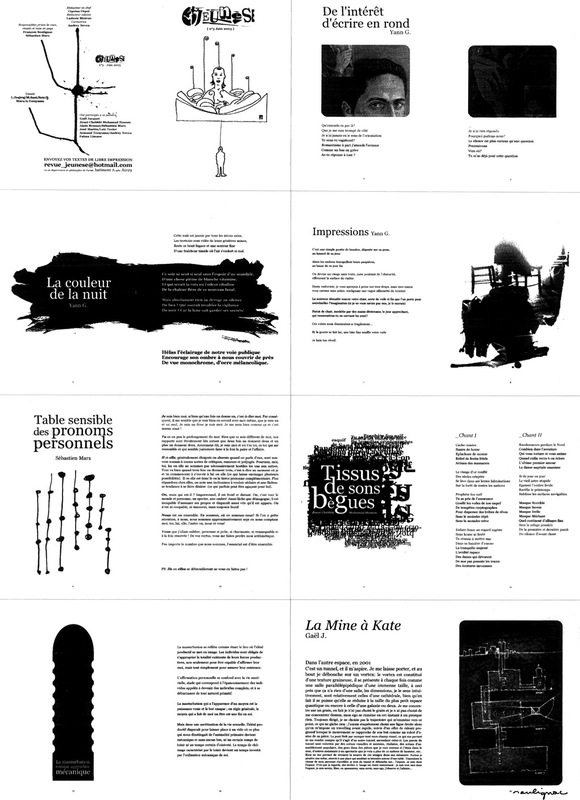 Fully self-published, with original texts only, and reproduced via photocopier by the press department of Paris 8 University, the editorial line of the Revue Jeunèse was focused on emergent researchs related to poetry, personal studies and essays. 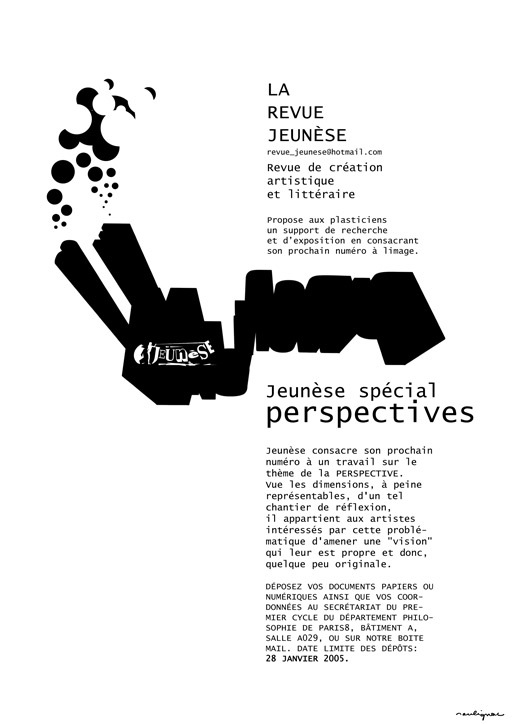 All topics could be included, except politic subjects. 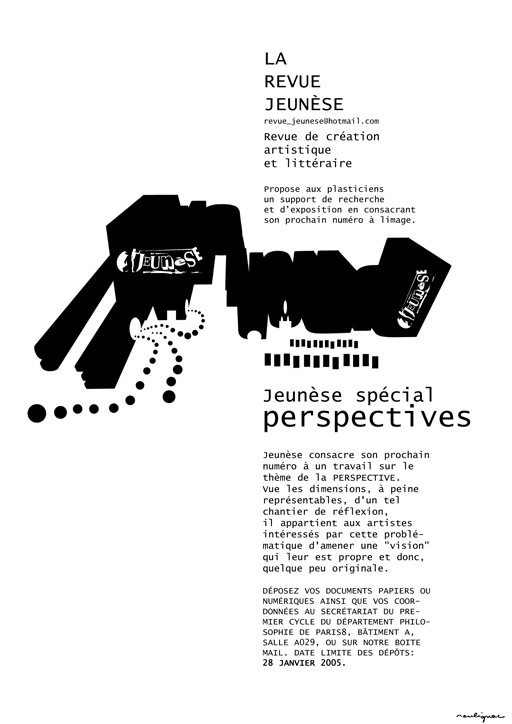 Art direction, Graphic design, Illustrations & Photography : (c) François Soulignac, 2003-2005. 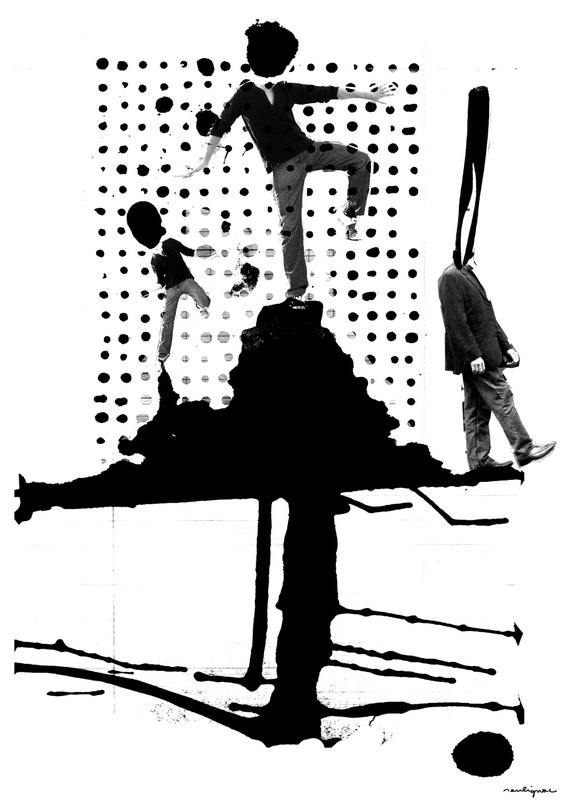 Technic : Ink, Pencil, Brush, Photography, Photoshop, QuarkXPress. 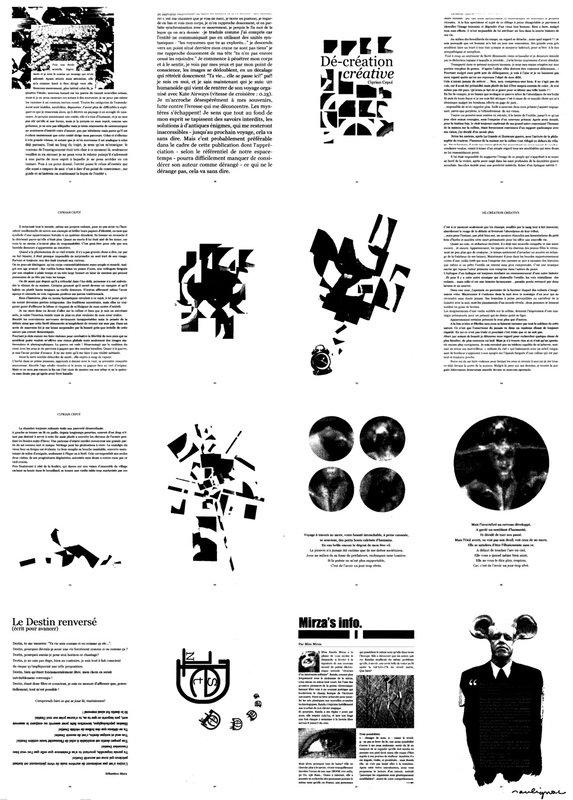 Managing editors : Ciprian C, Ludovic M, Sébastien M. Proofreading : Raphaëlle V, Audrey N. Additional visuals : Soic Miterne, Pascal M, Olivier K, Li B, Raphaëlle V, Lendita, Simon A, Altin R, Sébastien M, L. Zeqiraj, M. Sani, A. Terayama. 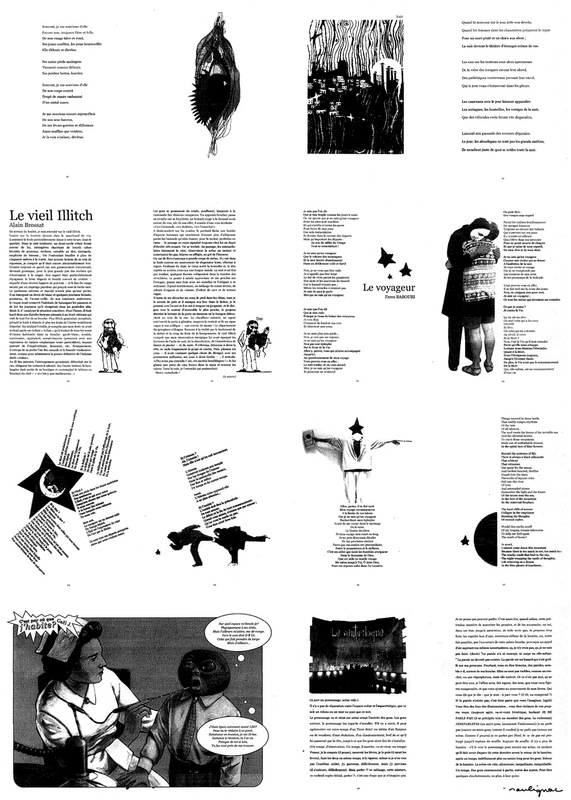 Texts : Ciprian C, Vincent K, Yann G, Laure DR, Zouzi CMH, Armand T, Alain B, Jean-Louis D, Fares B, Gaël J, José M, Sébastien M, Loïc T, Audrey N, Fatma L.
This entry was posted in Illustration and tagged Fanzine, Illustration, Magazine, Portmanteau of fan, Revue Jeunèse, Soic, Zine by François Soulignac. Bookmark the permalink.